Among other projects I worked on as a graduate student in Sharon Juliano's lab, I studied radial glial (RG) cell morphology and translocating RG cell morphology in the developing ferret brain. My education was informed by observation and literature, including Pasko Rakic's 1979 "A Golgi Study of Radial Glial Cells in Developing Monkey Telencephalon: Morphogenesis and Transformation into Astrocytes", and Thomas Voigt's 1989 "Development of Glial Cells in the Cerebral Wall of Ferrets: Direct Tracing of Their Transformation From Radial Glia Into Astrocytes". One question we examined in the Juliano lab was whether it was possible to alter RG cell morphology: could we induce translocating RG cells to revert back to the bipolar morphology of RG cells in the ventricular zone, and if so would that alter RG cell function? Those experiments continue in Sharon's lab. I carried my enthusiasm for cortical development and radial glial cells along with me to Arnold Kriegstein's lab where I performed my post-doctoral studies. I had been making time-lapse videos of radial glial cells in vitro for over a year in Arnold's lab when I recorded this translocating radial glial cell in November, 2002. I published a protocol describing the time-lapse method I developed to record RG cell behaviors and phenotype daughter cells. Click here to read the protocol - it includes step by step instructions and a few photos of my setup. Briefly, I labeled embryonic rat RG cells through in utero retroviral injection on E15 or E16, prepared organotypic slices one day later and began recording immediately. The recordings lasted several days - in this experiment 5 days. This time-lapse sequence was included in my 2004 Nature Neuroscience publication. The movie captures the final RG cell division at the surface of the ventricle and subsequent translocation of the RG cell away from the ventricle toward the cortical plate. The RG cell appears to continue dividing away from the ventricle since clonal number increases. In my embryonic time-lapse recordings (all performed in embryonic rat neocortex), the RG cells that translocated away from the ventricle would only do so after first undergoing a final division at the VZ surface. At the time I made this recording there were reports that translocating cells in the developing brain were neurons, rather than glial cells. To test the idea, after completing the time-lapse recording I fixed this slice and immunostained it with anti-TuJ1 antibodies. This was the perfect opportunity, I thought, to test if a translocating cell expressed a neuronal marker like Tuj1. However, the antibodies did not penetrate far enough into the organotypic slice to reach the translocating cell and I was unable to determine if this particular translocating cell expressed phenotypic features typical of neurons. I therefore performed more in utero retroviral labeling and this time allowed development to proceed in vivo. After fixing the brains I immunostained many sections of embryonic rat neocortex to test if translocating RG cells that developed in vivo, rather than in culture, exhibited neuronal features. None of the translocating RG cells identified in vivo expressed neuronal markers. Instead, many expressed detectable levels of GFAP in the soma. To further address this question, in subsequent time-lapse experiments I used electrophysiological recordings, rather than immunostaining, to phenotype translocating cells. The E-phys recordings showed that translocating RG cells were not neurons - they had the membrane properties of astroglial cells. The immuno data and E-phys recordings obtained from translocating RG cells were included in the 2004 Nature Neuroscience article. These data were consistent with earlier publications showing RG cell translocation and transformation into astroglial cells by Rakic, Voigt and others. Translocation of a radial glial cell out of the ventricular zone. This time-lapse video shows a cortical neuron, as a single cell clone, migrating from the proliferative zones to the cortical plate over 4 days of recording. The time-lapse approach revealed that rather than migrating directly from the ventricle to the cortical plate, newborn cortical neurons in the dorsal telencephalon went through stages of migration that involved a multipolar phase, and a retrograde movement toward the ventricle before commencing radial migration toward the cortical plate. Cortical neurons exhibit four stages of migration. These three videos show symmetric pairs of cortical neurons migrating toward the cortical plate. The sister neurons were produced by the terminal symmetric divisions of intermediate progenitor cells. These cortical neurons also demonstrated retrograde movements toward the ventricle before commencing radial migration toward the cortical plate. Ventricular-directed behavior had previously been reported for cortical interneurons migrating to the dorsal cortex by the Parnavelas lab. The retrograde movements toward the ventricle therefore appear to be a common behavior among migrating cortical neurons. This time-lapse movie shows the outgrowth of an axonal process for a cortical neuron during the multipolar phase of migration. The goal of this project was to test the relationship between the angle of dividing precursor cells and daughter cell fate. Background: If you examine mitoses at the surface of the lateral ventricle, you'll notice that most divide with a vertical orientation, but that some divide with oblique or horizontal orientations (see figure at right). It is thought that the different orientations represent different types of divisions. The model, as it relates to the mammalian neocortex, predicts that a vertical cleavage plane orientation is associated with symmetric divisions, while a horizontal orientation is associated with asymmetric, neurogenic divisions. This mechanism is thought to segregate fate determinants and thus determine daughter cell fate. This concept has been around for a very long time. Many have addressed this topic. 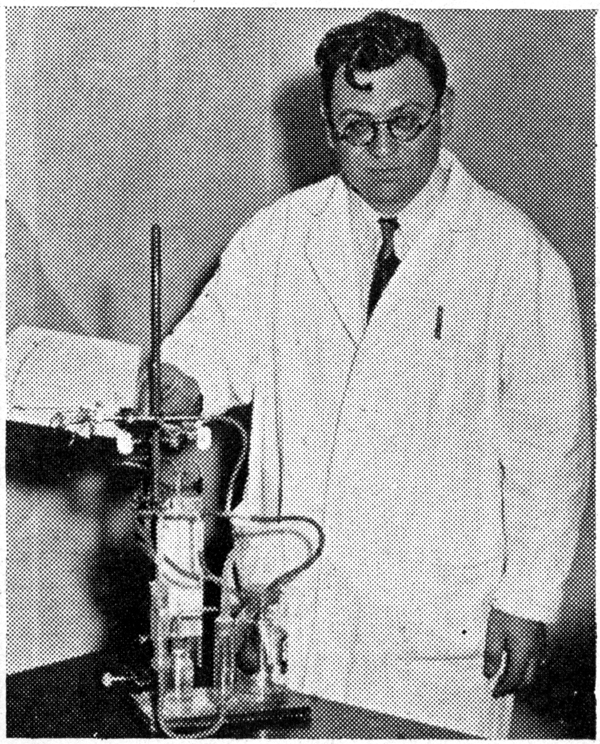 In his 1935 paper "Mitosis in the Neural Tube" Frederick Sauer (pictured at left) wrote that the number of horizontal divisions at the ventricle was not sufficient to account for the number of cortical neurons. Yet, the hypothesis remained attractive, and was supported by work in Drosophila showing that the cleavage plane of dividing ganglion mother cells can be correlated with daughter cell fate. But, the idea had not been tested in mammalian neocortex in experiments that recorded cleavage plane angle during division, and then tracked daughter cells over sufficient time for daughter cells to mature and express their mature phenotype. So, I labeled precursor cells with eGFP and prepared organotypic slices at early (E13-E15) or late stages (E16-E19) of rat cortical development. I recorded angle of division in the VZ and SVZ. After several days of time-lapse recording I phenotyped daughter cells by considering the morphology, behavior, and physiological recordings of the daughter cells. The results showed major differences between mode of division in the VZ and SVZ. This movie shows a vertical RG cell division at the ventricle - at the t=2h 51m mark - producing asymmetric daughter cells. One daughter is a self renewed RG cell that inherits the pial fiber and returns to the ventricle to divide again. The second daughter is an intermediate progenitor cell that migrates away from the ventricle and divides horizontally in the SVZ to produce 2 cortical neurons. These experiments demonstrated that vertical divisions can produce asymmetric daughter cells, and that vertical divisions were not perfectly vertical - they averaged 82.9º with the cleavage plane always tilting away from the daughter cell that inherited the RG pial fiber. The results were based on 36 RG cell divisions and 24 IP cell divisions recorded via time-lapse in vitro, and in vivo cleavage plane angle measurements of 1536 ventricular surface divisions and 879 SVZ divisions. In sum, angle of division did not predict daughter cell fate. Instead, daughter cell fate was correlated with the stage of neurogenesis and the location of division: Divisions at the ventricle during early stages of cortical development were mostly symmetric, while during later stages divisions at the ventricle were mostly asymmetric, regardless of orientation. After the onset of neurogenesis, divisions that occurred at the ventricle were largely asymmetric and those in the SVZ were largely symmetric. This suggests that inheritance of fate determinants is not controlled by the angle of division, but by other factors I'd be happy to discuss if you give me a call! Vertically produced, asymmetric translocating radial glial cell. This time-lapse movie is another example showing that vertical divisions can produce asymmetric daughter cells. The RG cell divided vertically at the t=24h:30m mark, yet produced morphologically asymmetric daughter cells: one daughter cell retained the pial fiber and the second daughter cell remained close to the mother RG cell over 100+ hours of time-lapse recording. After division the RG cell detached from the ventricle and translocated toward the cortical plate. The translocating RG cell remained proliferative, dividing two additional times at the t=52h time point, and the t=83h time point. After 100+ hours of time-lapse recording I transferred the organotypic slice to an Ephys rig and obtained whole-cell patch-clamp recordings from each cell. All four cells exhibited the membrane properties of astroglial cells. This result was obtained in 3 consecutive experiments. The astroglial membrane properties recorded from the translocating RG cell, and its daughters, stands in contrast to the neuronal membrane properties I readily and consistently recorded from daughter cells produced by IP cell divisions. This time-lapse movie shows another vertical RG cell division yielding morphologically distinct daughter cells. The division at t=4h was vertical, and yielded one daughter cell that retained the pial fiber (red arrowhead), and a second daughter cell (red arrow) that remained close to the mother cell over 100+ hours of time-lapse recording. The RG cell loses contact with the ventricle during recording. The ventricular contacting process appears to degrade at the t=39h and t=45h time points, and was no longer visible after that point. This time-lapse movie was recorded from a radial glial cell in the E13 rat, during early stages of cortical development. Cytokinesis begins at the t=30m timepoint, and this RG cell division produces two daughter cells that have similar morphology. In contrast to the RG cell divisions at the ventricle that were mostly vertical - 34/36 time-lapse recordings of RG cells were vertical - I found that IP cells were more likely to divide with a horizontal orientation during neurogenic stages of cortical development. The horizontal division of IP cells produced symmetrically fated daughter cells, as classified by morphology, behavior and physiological recordings. In the time-lapse recordings I observed that the RG cell pial fiber became very thin during M-phase of division. The fiber became so thin that in some cases I had to either expose the cell to higher laser power, or scan for a longer time to visualize the fiber. Of interesting, I noticed that as the fiber became thinner I could detect multiple varicosities traveling along the fiber in both directions but most often towards the RG cell soma. In many cases one or more of the varicosities entered the RG cell soma prior to division. This time-lapse movie shows a radial glial cell entering G2-phase of the cell cycle. During G2 radial glial cells that maintain contact with the surface of the ventricle approach the ventricle where they will undergo cytokinesis. Making a time-lapse movie is not actually as technically challenging as you might think. Laser-scanning confocal microscopy of the summer solstice sun rising over sunflowers in Davis, CA. Among other projects I worked on as a graduate student in Sharon Juliano’s lab, I studied radial glial (RG) cell morphology and translocating RG cell morphology in the developing ferret brain. My education was informed by observation and literature, including Pasko Rakic’s 1979 “A Golgi Study of Radial Glial Cells in Developing Monkey Telencephalon: Morphogenesis and Transformation into Astrocytes”, and Thomas Voigt’s 1989 “Development of Glial Cells in the Cerebral Wall of Ferrets: Direct Tracing of Their Transformation From Radial Glia Into Astrocytes”. One question we examined in the Juliano lab was whether it was possible to alter RG cell morphology: could we induce translocating RG cells to revert back to the bipolar morphology of RG cells in the ventricular zone, and if so would that alter RG cell function? Those experiments continue in Sharon’s lab. I carried my enthusiasm for cortical development and radial glial cells along with me to Arnold Kriegstein’s lab where I performed my post-doctoral studies. I had been recording time-lapse videos of radial glial cells in vitro for over a year in Arnold’s lab when I recorded this time-lapse movie of a translocating radial glial cell in November, 2002. I published a protocol describing the time-lapse method I developed to record RG cell behaviors and phenotype daughter cells. Click here to read the protocol – it includes step by step instructions and a few photos of my setup. Briefly, I labeled embryonic rat RG cells through in utero retroviral injection on E15 or E16, prepared organotypic slices one day later and began recording immediately. The recordings lasted several days – in this experiment 5 days. This time-lapse sequence was included in my 2004 Nature Neuroscience publication. The movie captures the final RG cell division at the surface of the ventricle and subsequent translocation away from the ventricle toward the cortical plate. The RG cell appears to continue dividing away from the ventricle since clonal number increases. In my embryonic time-lapse recordings (all performed in embryonic rat neocortex), the RG cells that translocated away from the ventricle would only do so after first undergoing a final division at the VZ surface. At the time I made this recording there were reports that translocating cells in the developing brain were neurons, rather than a form of radial glial cell. To test this idea, after time-lapse recording I fixed the slice and immunostained with anti-TuJ1 antibodies. However the antibodies did not penetrate far enough into the organotypic slice to reach the clonal cells and I was not able to answer that question in this experiment. I therefore immunostained many fixed sections of embryonic rat neocortex that had developed in vivo, rather than in culture. None of the translocating RG cells in vivo expressed neuronal markers. Instead many expressed detectable levels of GFAP in the soma. In subsequent time-lapse experiments I used electrophysiological recordings, rather than immunostaining, to phenotype translocating cells. The E-phys recordings showed that translocating RG cells were not neurons – they had the membrane properties of astroglial cells. The E-phys recordings of translocating RG cells were included in the 2004 Nat. Neuroscience article. These data were consistent with earlier publications showing RG cell translocation and transformation into astroglial cells by Rakic, Voigt and others. Intermediate progenitor cells in the SVZ produce pairs of cortical neurons. Migrating neurons grow lengthy axonal processes before reaching the cortical plate. Vertical divisions produce asymmetric daughter cells. The goal of this project was to test the relationship between the angle of dividing precursor cells and daughter cell fate. Background: If you examine mitoses at the surface of the lateral ventricle, you’ll notice that most divide with a vertical orientation, but that some divide with oblique or horizontal orientations (see figure). It is thought that the different orientations represent different types of divisions. The model, as it relates to the mammalian neocortex, predicts that a vertical cleavage plane orientation is associated with symmetric divisions, while a horizontal orientation is associated with asymmetric, neurogenic divisions. This mechanism is thought to segregate fate determinants and thus determine daughter cell fate. This concept has been around for a very long time. Many have addressed the topic. 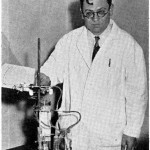 In his 1935 paper “Mitosis in the Neural Tube” Frederick Sauer (pictured at left) wrote that the number of horizontal divisions at the ventricle was not sufficient to account for the number of cortical neurons. Yet, the hypothesis remained attractive and was supported by work on ganglion mother cells in Drosophila showing that cleavage plane of dividing precursor cells is correlated with daughter cell fate. But, the idea had not been tested in mammalian neocortex in experiments that recorded cleavage plane angle during division and then tracked daughter cells over sufficient time for daughter cells to mature and reliably express phenotype. So, I labeled precursor cells with eGFP and prepared organotypic slices at early (E13-E15) or late stages (E16-E19) of rat cortical development. I recorded angle of division in the VZ and SVZ. After several days of time-lapse recording I phenotyped daughter cells through a combination of morphology, behavior, and Ephys recordings. The results showed major differences between mode of division in the VZ and SVZ. This movie shows a vertical RG cell division at the ventricle – at the t=2h 51m mark – producing asymmetric daughter cells. One daughter is a self renewed RG cell that inherits the pial fiber and returns to the ventricle to divide again. The second daughter is an intermediate progenitor cell that migrates away from the ventricle and divides horizontally in the SVZ to produce 2 cortical neurons. These experiments demonstrated that vertical divisions can produce asymmetric daughter cells, and that vertical divisions were not perfectly vertical – they averaged 82.9º with the cleavage plane always tilting away from the daughter cell that inherited the RG pial fiber. The results were based on 36 RG cell divisions and 24 IP cell divisions recorded via time-lapse in vitro, and in vivo cleavage plane angle measurements of 1536 ventricular surface divisions and 879 SVZ divisions. In sum, angle of division did not predict daughter cell fate. Instead, daughter cell fate was correlated with the stage of neurogenesis and the location of division: Divisions at the ventricle during early stages of cortical development were mostly symmetric, while during later stages divisions at the ventricle were mostly asymmetric, regardless of orientation. After the onset of neurogenesis, divisions that occurred at the ventricle were largely asymmetric and those in the SVZ were largely symmetric. This suggests that inheritance of fate determinants is not controlled by the angle of division, but by other factors I’d be happy to discuss if you give me a call. Vertical divisions produce translocating radial glial cells that remain proliferative. Vertical divisions produce translocating radial glial cells. E13 Rat RG cell division. Symmetric IP Cell Division in the SVZ. In contrast to the RG cell divisions at the ventricle that were mostly vertical – 34/36 time-lapse recordings of RG cells were vertical – I found that IP cells were more likely to divide with a horizontal orientation during neurogenic stages of cortical development. The horizontal division of IP cells produced symmetrically fated daughter cells, as classified by morphology, behavior and physiological recordings. Pial fiber varicosities enter RG cells before division. Radial glial cell in G2-phase.